Today was a milestone day. Tooth # 7 was encouraged to come out with a lot of wiggling and pulling. 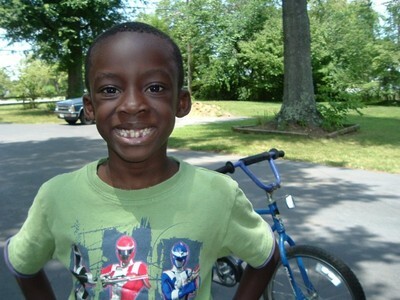 Now Matthew is without his two upper teeth and five lower teeth, although four new lower teeth have come in well. The dentist says that it’s going to be a bit crowded in there and from my vantage point I don’t see any room for the new eye tooth. The Tooth Fairy is getting a run for his/her money! We actually lost tooth #6 but the TF came through anyway. On vacation we tried Matthew out on his bike riding. Due to our limited space at the clinic he doesn’t have a bike and rode his tricycle until his knees were nearly hitting him in the chin. The bigger bikes were very scary for Matthew and he only gave Aunt Diane two tries at running behind him. 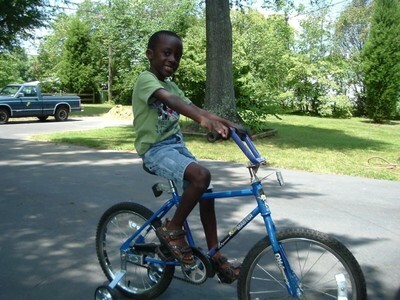 I bought him a 20″ used bike with training wheels which he road up and down Grandmommy’s driveway. Well, today (again, after Jr. Soldiers) Matthew stayed over at the officers’ house to play with their two boys. 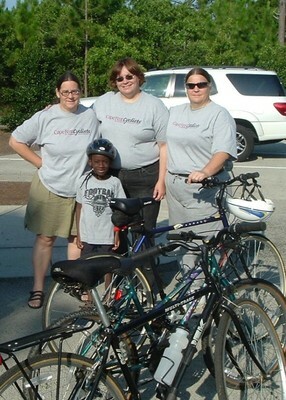 Within an hour (and without Mom looking on), they taught Matthew to ride a 18″ bike with NO TRAINING WHEELS!!! Matthew excitedly showed off his new skills when I came to pick him up. I expect that in just a few more days he will “graduate” to the boys’ 20″ bike. That means, if he gets to go with me to the US the end of September he can ride the trails with us. Won’t that be fun. MATTHEW, CONGRATULATIONS ON YOUR ACCOMPLISHMENT! Your son is growing up before our very eyes! He is so handsome…..and looks so proud of himself! Amy couldn’t learn how to ride with my husband so we had her brother Markd (13 years older than her) teach her. She learned how right away. Mark is such a calm person and was able to convince Amy of anything. Sometimes that hurts the parent’s pride though. Did Steve for awhile. We have grandchildren losing teeth just like Matthew. Everytime we see them we get to feel the loose one.